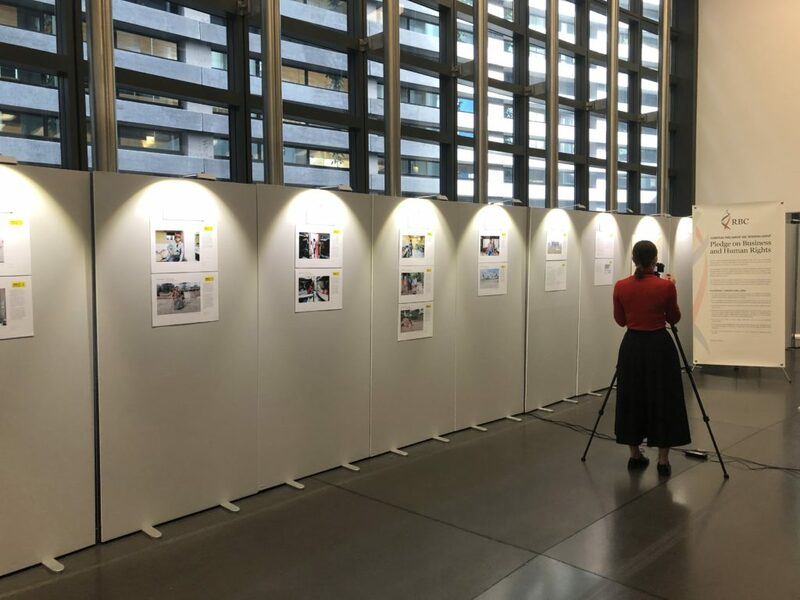 The RBC working group organised an Exhibition on Business and Human Rights at the European Parliament in Strasbourg on the 11-14 March. 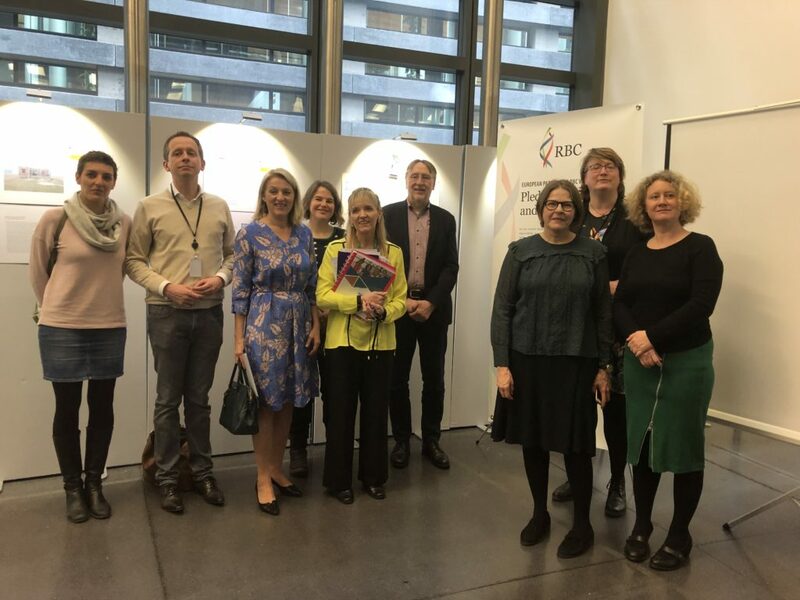 At the exhibition the Pledge on Business and Human Rights for opened for signatures for current MEPs as well as Candidates in the European Elections. My name is Anne-Marie Mineur, I am an MEP for the Dutch Socialist Party, and I am a member of the Responsible Business Conduct working group. I am very pleased to welcome you to the opening of this exhibition. This exhibition demonstrates the need for responsible business conduct, and the need for more commitment from present and future MEPs. It is also a precursor to the event that is organised by the Responsible Business Conduct working group called “Gearing Up EU Action” at the Press Club in Brussels, next week Tuesday. The photos you see here are from Frédéric Lecloux, who made them in collaboration with Amnesty International France. They show the torn families of Nepalese workers who travelled thousands of kilometres to work in Qatar. The quality of life of the workers is inhumane, there is violence and heat, there are suicides and accidents, there is no healthcare and no safety, and after long and hard working days, there is only a life full of loneliness, boredom and deprivation. The families who stay behind in Nepal miss their spouse, their parent, their child, but also their workforce. The fact that these workers leave their country undermines the social fabric of society. There are millions such workers all over the world, and there is a lot of misery like this. This is the result of globalisation. This is what we get when we remove all trade restrictions and open all borders: multinationals start to consider workers as a commodity that can be hired and fired at will. This is a dehumanising way of dealing with humans, and human rights. We cannot let this happen. In the last couple of years, we have worked hard to make sure that people are treated in a humane and dignified way. That they receive a fair pay for work that was done under just conditions, for instance, that they are allowed to join a labour union, and that their human rights are respected. But we have seen that guiding principles are not enough. So we have also fought for a Binding Instrument on Business and Human Rights, in order that we can hold to account these powerful corporations that prey on the weak. We have also fought against free trade agreements, which give great freedom to businesses, without offering the possibility of sanctions when they violate the sustainable development chapters. and the global level, i.e. the United Nations, as I have just mentioned, the OECD guidelines for multinational enterprises, and the ILO to whom I earlier this month proposed a convention on crowd working, in order to harness the platform economy. Everything we have achieved and everything we still fight for must not be lost. For that reason we have drawn up this pledge, which commits present and future MEPs to keep fighting for responsible business conduct. The first person to sign this pledge is the lead candidate of my party, Arnout Hoekstra. Arnout will take over where I leave off, and I am pleased and proud that he takes this pledge. I wish him every success.